Because news doesn’t stop when you’re sleeping, America starts the day with America in the Morning, WestwoodOne’s award-winning radio news magazine. America in the Morning offers up-to-the-minute news reporting from around the country and across the globe, with all the latest overnight developments in breaking news, politics, entertainment, business and sports, delivered first thing in the morning. Hosted by Brian Kilmeade of the top rated morning show in cable news, Fox and Friends. 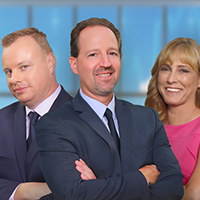 Brian will offer his take on the top stories of the day, with newsmakers and guest experts offering their insight and perspective, along with segments featuring the top personalities of Fox News Channel and Fox Business Network. And, of course, listener’s point-of-view and discussion are always welcome. Chris is a practical, principled, independent-minded, Constitutional conservative – with a libertarian streak – and is unabashedly pro-American. His daily radio program is entertaining, irreverent, and clever as he weaves pop culture references into his discussion of the news of the day. Devoted listeners say that Chris makes them laugh, even when discussing the most difficult of subjects. “That is my favorite thing to hear”, says Chris. Sean Hannity is a multimedia superstar, spending four hours a day, every day, reaching out to millions of Americans on radio, television and the internet. Hannity is the second most-listened-to talk show host in America, according to Talkers magazine. Hannity’s energy, charisma, Reagan conservatism scores high points with audience and critics alike as he continues to be one of the hottest commodities in media. Mark Levin has become one of the hottest properties in Talk radio. He is also one of the top new authors in the conservative political arena. Mark’s show manages to come up with a new twist on the day’s top news events, as well as his own unique information. He currently practices law in the private sector, heading up the prestigious Landmark Legal Foundation in Washington DC. Millions listen to The Dave Ramsey Show every day for common-sense talk on money. Listeners are also tuning in to hear real callers share real stories about their lives and families. They call the show in desperate need of help. They call to celebrate. And if you listen closely enough, you’ll hear a story much like yours. Hope has a home on the radio. Each night on the program, Lewis discusses all matters of the paranormal, UFOs and conspiracies, and shares his passionate and knowledgeable approach to news, current events and politics. His unique, non-conventional, and often theatrical, take on late-night talk radio has made him a consistent ratings winner in Portland.